There's not too much information regarding this California manufacturer. 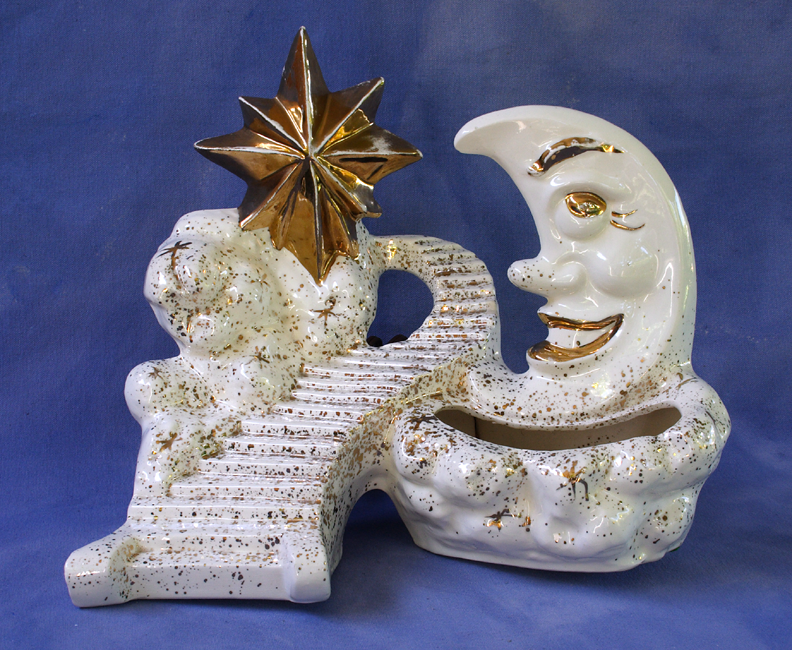 Birds seem to be the primary subject matter of their TV lamps... and then there's that crazy "moon and star" lamp! 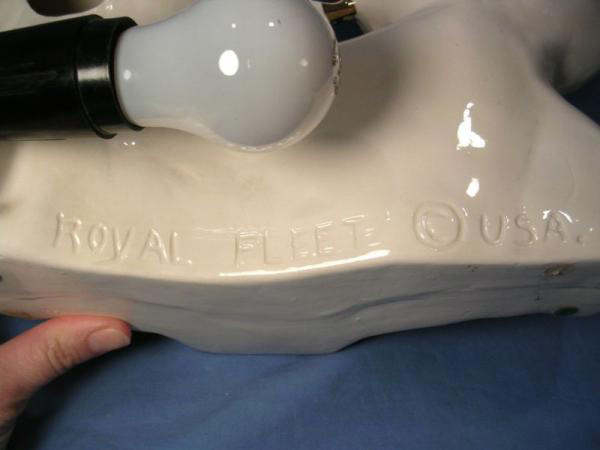 Some of the Royal Fleet lamps can be found with a Norfleet marking, which is probably indicative of a name change at some point in their history. 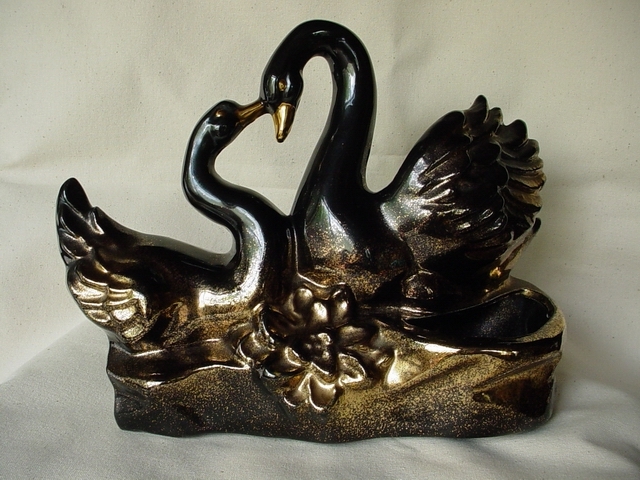 The gold highlights on black really exemplifies the '50s. Royal Fleet applied their gold detailing with great care, giving a beautiful jewel-like quality to the finish. 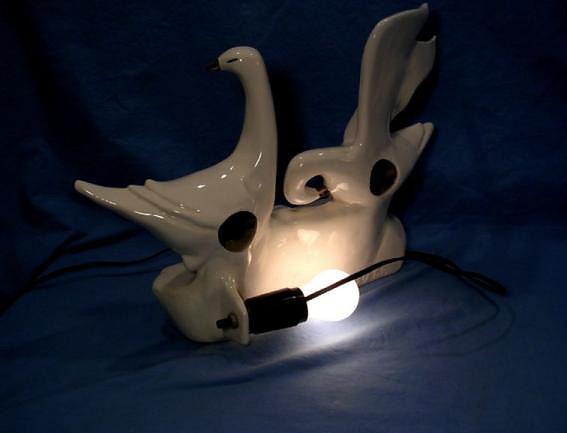 The gold highlights over red on this "Two Doves" TV lamp is a knock-out! Photo courtesy of Chris, in Winlock, WA. Same Royal Fleet as shown above, this time in white. Photos courtesy of R.L. Rising of Rising Sky Artworks. I've got some doubt as to this example having been manufactured by Royal Fleet. The resemblance to the previous TV lamp is obvious, only this one is unmarked and appears stylistically to be the work of a different designer. I suspect that one designer "borrowed" the basic form and interpreted it, adding it to the line of another company. The final glaze on this TV lamp has an iridescent, mother-of-pearl quality. 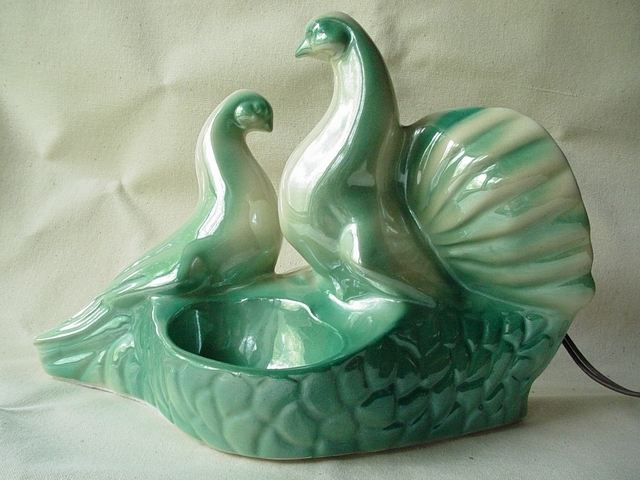 The depression in the front was probably intended to be a candy dish. This one is just great! 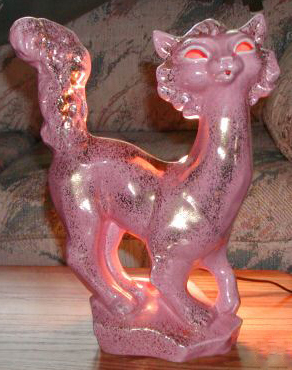 My favorite TV lamps tend to be a bit on the unusual side, and this example from Royal Fleet certainly qualifies. 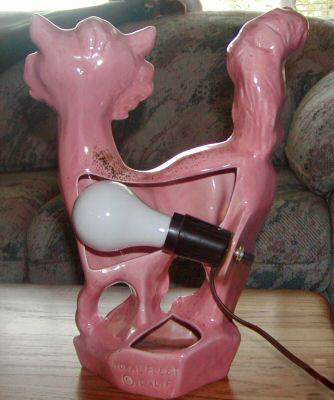 It's always a pleasure to discover a previously unknown lamp, and I owe a debt of gratitude to a most generous tvlamps.net visitor for sharing this one. Many thanks to Shirley Tennant from Nelson, British Columbia, Canada, who brought it to my attention and was kind enough to photograph it for me! 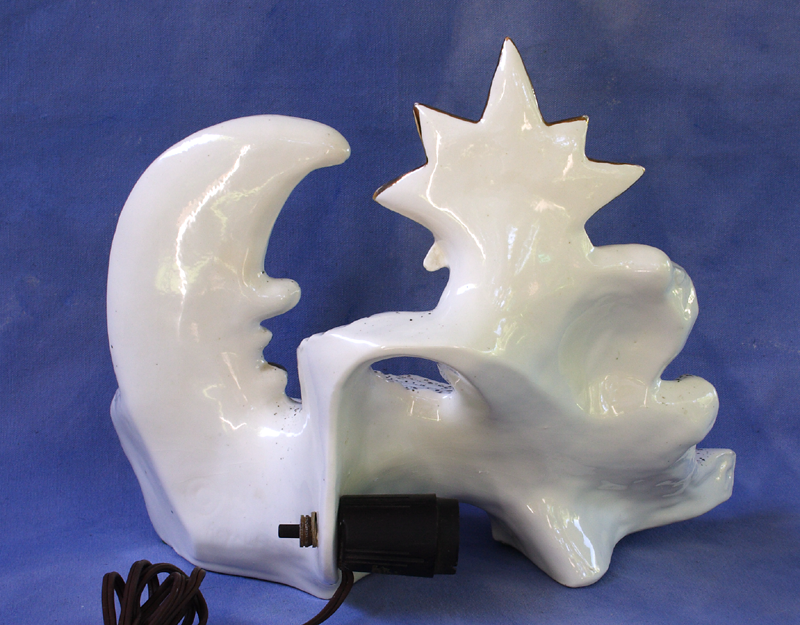 Another example of Royal Fleet's great "Star and Moon" TV lamp, this time in white. 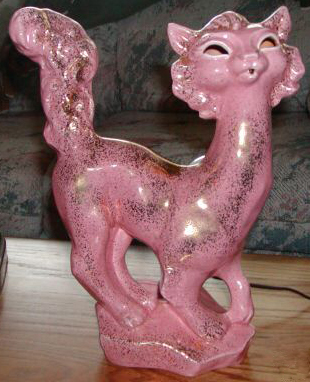 I don't know what colors the lamp was produced in, but besides pink and white I've also been told of a blue one. 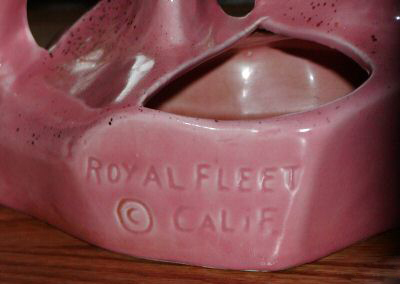 Blue was a seldom-used color in mid-century pottery, but Royal Fleet had a shade that they used on several items. 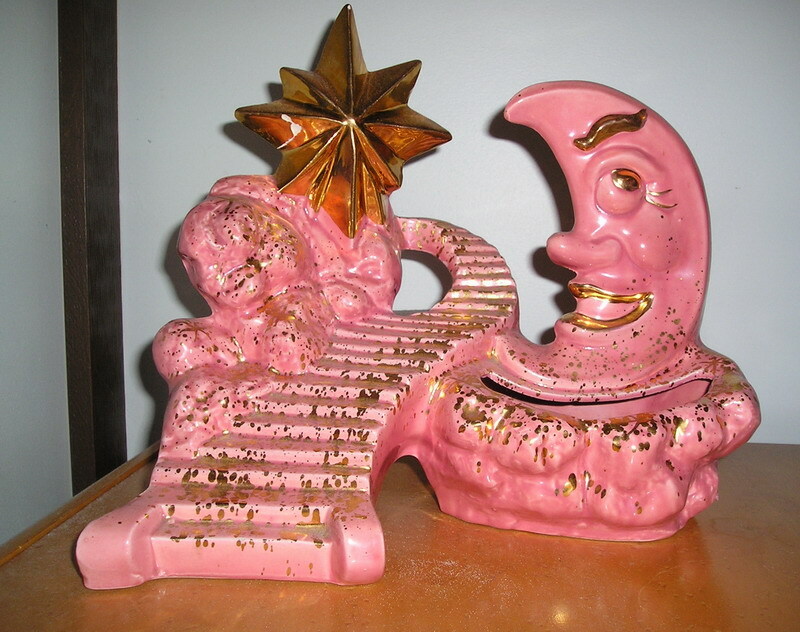 Back view of the star and moon lamp. 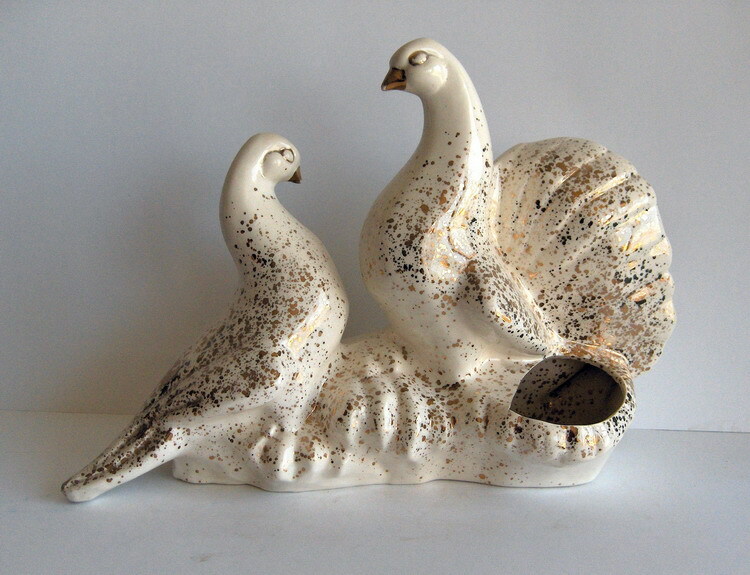 The mold that these came from had to have been very intricate, which could explain their rarity. This Royal Fleet cat is a real treasure! It is seldom seen, and I don't know all the colors that were available, but I've seen black and I suspect that white was offered as well. Photos courtesy of eBay seller, 2birddog4me. Back view of the Royal Fleet cat. Our cat is plainly marked on the back of the planter. On the bottom is a hand-scrawled RF 20. The style number? 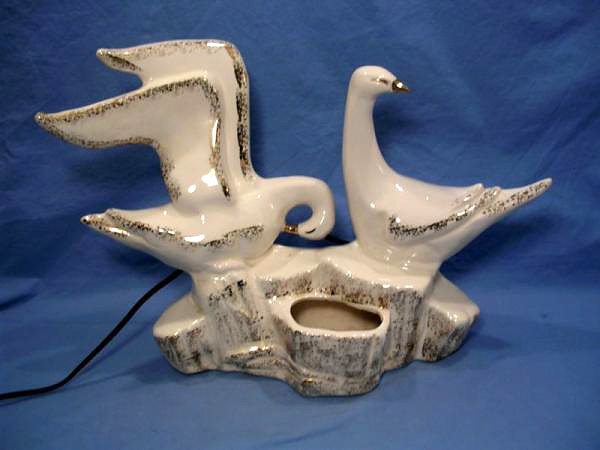 I'd like to give this Royal Fleet Seagull lamp a sixth star for rarity, as this is the only one I've seen! Here it is on all its glowing splendor. 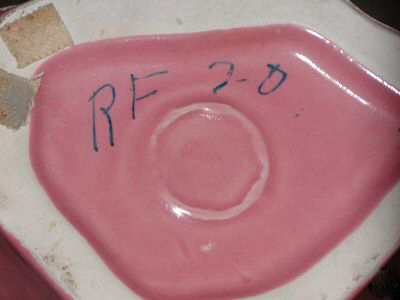 The marking is very crisp and legible, this lamp obviously having been cast from a new (newish) mold.